Alas, he is a very famous man but all for the wrong reasons. The interpreter who was widely ridiculed for his performance at the Nelson Mandela memorial stood by his work. Thamsanqa Jantjie told CNN affiliate Radio 702 in Johannesburg that he is a fully qualified interpreter and has been trusted in the past with other big events. Not so, says the head of the South Africa Translators’ Institute. There were complaints last year after Jantjie interpreted the proceedings at the ruling African National Conference elective conference, the institute’s chairman Johan Blaauw told the South African Press Association. The radio station interviewer asked Jantjie to comment on media reports that he was hearing voices in his head and hallucinating during the Mandela event Tuesday. As outrage over his interpretation skills grew, so did questions over who hired him. A spokesman for the ANC said the party had not hired him for the Mandela event. “We have used him on some occasions. But yesterday was not an ANC event. So we cannot answer for yesterday,” spokesman Jackson Mthembu said Wednesday. The South African government was investigating the reports, said Collins Charbane, minister for performance monitoring and evaluation in the presidency. Jantjie told Talk Radio 702 that he was hired by a company called SA Interpreters, which was hired by the ANC. He also said he’s formally qualified as an interpreter and that his qualifications are filed with the company. “I think that I’ve been a champion of sign language,” he said. The man showed no facial expressions, which are key in South African sign language, and his hand signals were meaningless, Druchen said. “It is a total mockery of the language,” he added. The service to commemorate Mandela, who died last week at 95, was broadcast to millions of viewers. 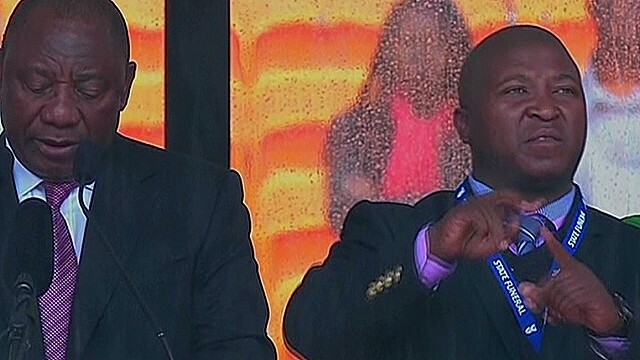 While dignitaries addressed the crowd at Johannesburg’s FNB stadium, Jantjie produced a series of hand signals that experts said meant nothing. This entry was posted in Uncategorized and tagged fake, Interpreter, schizophrenia. Rihanna will be singing her own version of “Who runs the world” now. But wait a minute that is Bey’s song and shouldn’t she be thanking someone for this feat. Yeah, you got that right . EMINEM! Her colllabo with Eminem on his second Marshall Mathers LP 2 single “The Monster,” bumped Miley Cyrus‘ “Wrecking Ball” off the top of the Hot 100 this week. According to Billiboard, the Bajan songbird has now tied Michael Jackson‘s string of 13 #1 singles in the US.. This puts MJ and RiRi behind only The Beatles (20) and Mariah Carey (18) as far as the most #1s, and it has them now just ahead of Madonna and The Supremes (both have 12). This entry was posted in Uncategorized and tagged hot 100 Records, Michael Jackson, Rihanna, ties. Huh-Um this is how it starts. But frankly I will be awfully disappointed if George turns out to gay. I am no gay hater, but I hate to see another beautiful ,make that gorge man affirm that he is gay. Hmmm…. anyway read on to see what one publication said about George. George Clooney’s sexuality is frequent fodder for the tabloids, but the superstar actor doesn’t feel the need to deny being gay. The Oscar winner recently opened up to Esquire U.K. about his sexuality in the cover story for the magazine’s January 2014 issue. For years, talk has circulated about the sexual preferences of Hollywood’s Most Eligible Bachelor. Clooney previously addressed the gay rumors in an interview with the Advocate last year, again refusing to deny them. Other actors have approached the sexuality question in a similar way. In September, Joseph Gordon-Levitt said he didn’t need to confirm or deny anything while speaking with Out magazine. “That would be really tacky — they would win if I had to clarify,” he contended. This entry was posted in Uncategorized and tagged deny, gay, George Clooney, never. Call it the selfie seen ’round the world. 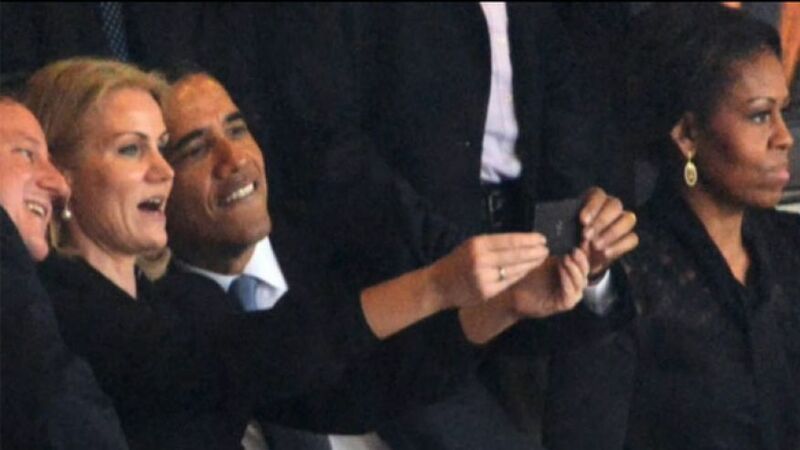 Among the enduring images from Nelson Mandela’s massive memorial service in Johannesburg Tuesday will be one of a jovial President Obama taking a cell phone pic with his seat-mates, Denmark’s Prime Minister Helle Thorning-Schmidt and Britain’s David Cameron. As the three of them smile for the camera, a stern-looking Michelle Obama can be seen staring straight ahead, hands clasped. As if to remind anyone who sees this photo years from now that it was, after all, a memorial service for one of the great human rights leaders. The tsk-tsk-ing could be heard for miles. The first lady’s reaction — not just to the “selfie” but to her husband’s chatting and joking with the young Danish prime minister — was priceless. In one picture, Michelle Obama could be seen glaring over at him while he put his hand on Ms. Thorning-Schmidt’s shoulder. In another, it appeared the first lady and the president switched seats, putting Michelle squarely between him and the PM. After the images surged through social media, the White House on Wednesday released its own set of photos of Obama’s South Africa visit. Perhaps it was no accident that among them was a picture of Obama, the first lady and the Danish prime minister. But in this one, Obama was talking to his wife, while Thorning-Schmidt seemed preoccupied with her phone. The “selfie” incident was the second unexpected controversy stirred up by the president in South Africa. Earlier, Cuban-American lawmakers publicly objected after Obama — on his way to deliver his tribute to Mandela — shook the hand of Raul Castro. Sen. Ted Cruz, R-Texas, who was at the Johannesburg service, walked out when Castro spoke. This entry was posted in Uncategorized and tagged Obama, Selfie. This entry was posted in Uncategorized and tagged Alex Ekubo, Ezinne Akudo, IK Ogbonna. Geez, Thieves have no reverence for the dead. They will steal from those in mourning and even from the dead if the could. Police in South Africa say retired Archbishop Desmond Tutu’s home was robbed while he was away to attend a memorial honoring Nelson Mandela. 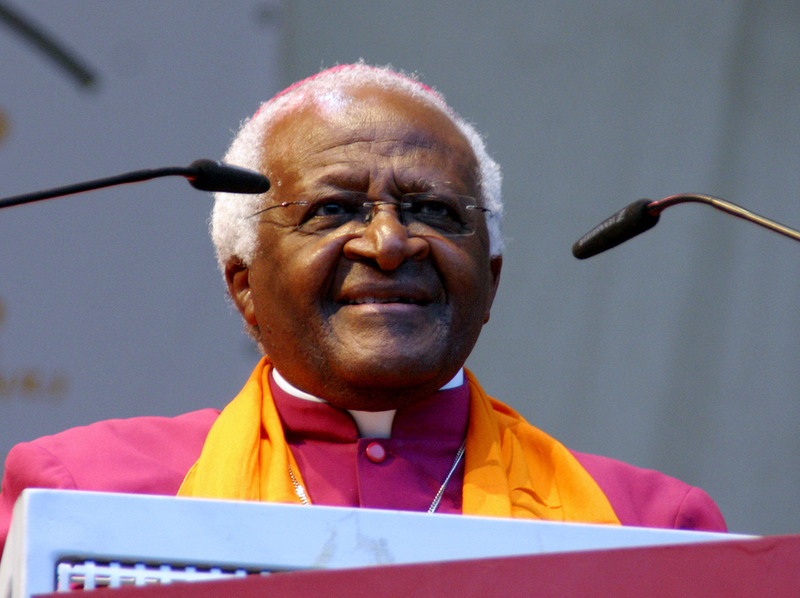 A statement Wednesday from the South African Police Service said the robbery of Tutu’s home in Cape Town happened between 7 p.m. and 9 p.m. Tuesday. That was the day the Nobel Peace Prize laureate and foe of apartheid spoke at the memorial service at a soccer stadium in Soweto township of Johannesburg. This entry was posted in Uncategorized and tagged Archbishop, burgled, Desmond Tutu, house, robbed. Ghanaian rap king, Sarkodie will launch his most anticipated third studio album, Sarkology, with a mega concert at the Accra Sports Stadium. Sarkology is an expansive LP with a mix that boasts an individual’s artistic delivery carefully honed over the years. The album is the third effort after Makye and Rapperholic. The manager of his label Duncwills Entertainment Sammy Forson says, the albumwill be launched together with what is expected to be the biggest outdoor event of the year in Ghana. The Accra Sports Stadium will come alive on December 21st, as the BET award winner, Ghana Music Awards artiste of the Year on two occasions, and 4Syte TV’s Most Influential Artiste of the Year 2013, takes to the stage in an unforgettable one-night-only date with his fans. 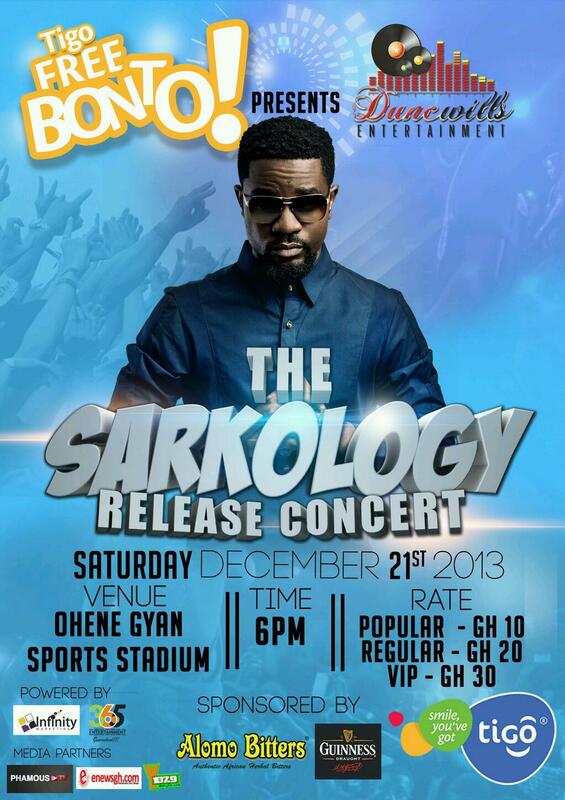 This entry was posted in Uncategorized and tagged Album launch, Sarkodie, Sarkology.